Dalai Lama debacle: Whose country is it anyway? In May this year the Norwegian government found itself in an awkward position when Tibet’s spiritual leader in exile, the Dalai Lama, visited the country to mark the 25th anniversary of his receiving the Nobel Peace Prize. The difference is that while the government of Norway refused to meet the Dalai Lama, unlike South Africa, it didn’t allow China to undermine its sovereignty and dictate who not to allow into the country. By MARIANNE THAMM. We all know China’s got a big global economic carrot that dangles over a world plunged into a horrendous recession. That’s why the government of Norway, yes Norway, that 110-year-old bastion of liberal democracy, refused to meet with the Dalai Lama during his three-day visit there in May, so as not to offend China. In 2010, Norway felt the economic sting of China’s wrath after awarding the Peace Prize to Chinese dissident Liu Xiaobo. China froze trade talks with the country and placed an unofficial trade embargo on Norwegian salmon. They touched them on their salmon, in other words, and it hurt, it hurt bad. Even Barack Obama has been careful and strategic with visits from the Dalai Lama and dealing with China’s threats that this would damage relations between the countries. In February, Obama met the Dalai Lama for 45 minutes; not in the Oval Office, mind you, but in the Map Room, “a modest concession to the Chinese” wrote the New York Times. Of course China had demanded that Obama cancel the meeting altogether, but hey, the guy’s under the impression he’s the leader of the Free World. Be that as it may, no official photographs of that particular meeting were released. Fast-forward then to Cape Town, 2 September 2014, and a few weeks before the 14th World Summit of Nobel Peace Laureates, featuring 14 Peace Laureates and 11 Peace Laureate organisations. It would have been the largest gathering of Nobel Peace Laureates in the history of the event, and was due to take place in the city from 13 to 15 October. The gathering would also have drawn a collection of some of the world’s most prominent and influential thinkers and activists under the theme “Peace. Living It!” It would have been the first time the event would be held in Africa; ironically it now seems, in celebration of 20 years of democracy as well as paying tribute to Nelson Mandela. For a moment, forget that the Dalai Lama is the “spiritual leader of Tibet” and view him simply as a Nobel Laureate, one of several who were due to attend the summit. This was not going to be an official visit or an arranged meeting with head of state like Dalai Lama’s previous three excursions to South Africa in 1996, 1999 and 2004, when he had met with Nelson Mandela. 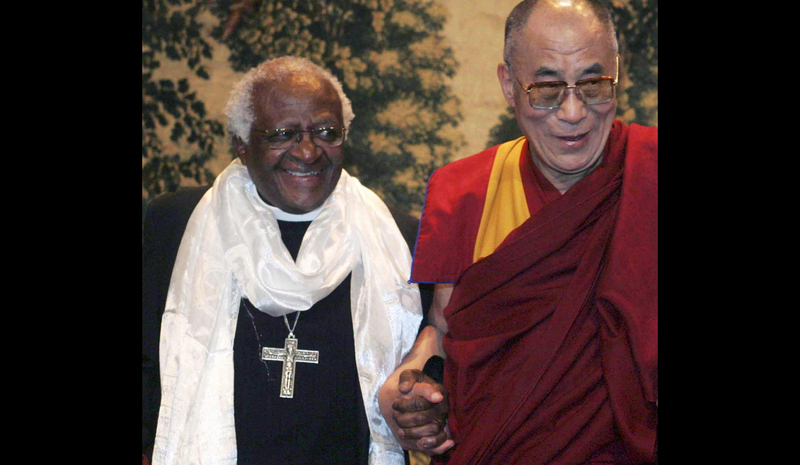 China had applied pressure on South Africa prior to all three of those visits, but Mandela had simply ignored this, informing Beijing that the Dalai Lama was a friend and spiritual leader and that they could take a running jump. South Africa, said Mandela, understood what it meant to live under an oppressive regime and besides, no one was going to tell the newly liberated country who could and couldn’t visit. None of the threats at the time translated into any economic sanction or punishment. We stood our ground. Mandela understood that China needed us as much as we needed them. Yesterday Cape Town Mayor, Patricia de Lille, officially announced that the annual summit had now been called off. Apart from “embarrassing the country”, she said the event had cost the City in the region of R225,000 and it was now in the process of cancelling contracts with service providers. “We are deeply angry and greatly disappointed that Cape Town will no longer be able to host the event. The City of Cape Town had already commenced event operations. As of today, a total of 584 delegates, 128 youths and 48 members of the media have registered on the event website since it went live. The expo at the event was also fully booked, with 22 exhibitors taking up 50 exhibition slots,” said De Lille. The announcement came a few days after six women laureates, Iranian lawyer Shirin Ebadi, American activist Jody Williams, Liberian activist Leymah Gbowee, Yemeni journalist Tawakkol Karman, Northern Irish activist Mairead Maguire and a representative of the International Campaign to Ban Landmines – cancelled their trip after the South African government refused to issue the Dalai Lama a visa. This is, of course, is the third occasion that government has denied him this right. Earlier in the day a tweet from the SABC Too parody Twitter account summed it all up quite succinctly: “You know there is something seriously wrong when Nobel Laureates boycott an event in your country”. Indeed, who would have thought it? We’re talking about post-Apartheid South Africa. South Africa that has delivered four Nobel Peace Laureates, one of them, of course, Nelson Mandela, regarded as one of the greatest contemporary statesmen. But Mandela is gone now and it appears as if his vision, his legacy, and the moral leadership he provided have been all but forgotten by a party caught up in a tawdry, inward-looking battle to prevent President Jacob Zuma from accepting responsibility for the massive state expenditure on his Nkandla home as well as protecting him from various other scandals that have dogged his administration. A fuming fellow Nobel Laureate, Archbishop Emeritus Desmond Tutu, used a choice but unusual adjective to describe the South African government; lickspittle. “I am ashamed to call this lickspittle bunch my government,” Tutu said in a statement. “Lickspittle” in case you haven’t already Googled it, is alternatively defined as “a person who behaves obsequiously to those in power”, “a fawning toady” or “a base sycophant”. Take your pick. De Lille, too, did not hold back at yesterday’s conference. “There is no doubt that the South African government is to blame for this situation. They have deliberately misled the public on their refusal to grant a visa to the Dalai Lama. They have claimed that they received no application, when it fact they made it clear to representatives of the Dalai Lama that no such visa would be issued for his attendance at the Cape Town summit this year,” said De Lille. She added that in so doing, government had undermined South Africa’s international standing and embarrassed the country. The National Government had treated the City’s requests and those of the Laureates themselves “with disdain, and in so doing showed that they are more intent on pleasing Beijing than with ensuring that a prestigious international event is held in South Africa, which was intended to celebrate the late Nelson Mandela and 20 years of democracy in South Africa. “President Zuma’s government has shamed the legacy of Madiba and it is now more clear than ever that South Africa under President Zuma has lost its moral compass and will do anything to appease the Chinese Government, which is a significant supporter of the ANC,” fumed De Lille. Nobel laureate FW de Klerk issued a statement that he had received the news that the summit had been suspended with “the greatest sadness”. “I have attended many former Summits and always looked forward to the day when South Africa would be able to host this prestigious event. This is because I believe that we South Africans can make a very special contribution to the international debate on the peaceful resolution of conflicts. What we achieved in South Africa between 1990 and 1996 is perhaps one of the best examples of the vision that Alfred Nobel had in mind when he instituted the prize more than a century ago,” said De Klerk. He added that while he understood the decision by laureates to boycott the summit “it was not the most appropriate response to the visa refusal”. “On 23 September Archbishop Tutu and I, together with the Nelson Mandela and Albert Luthuli Foundations, wrote to the Nobel Peace Laureates strongly urging them not to boycott the Cape Town Summit. We pointed out that by so doing they would simply hand the South African government exactly the outcome that it wanted. The government did not want the Summit to be held in South Africa – because it was concerned about the criticism that participants would inevitably direct against it for its refusal to grant a visa to the Dalai Lama,” said De Klerk. The main responsibility for the suspension of the Summit, said De Klerk, lies squarely with the South African government. The Dalai Lama, usually known for his quiet pragmatism in the light of various countries’ responses to China’s pressure, appeared to have lost patience and for the first time lashed out at the South African government. He has consistently promoted a “Middle Way” approach, which proposes neither assimilation nor independence for Tibetans in China. “The way South African government and the organising committee treated me was like bullying humble and weak person who has no protection,” the Dalai Lama said at a ceremony yesterday to mark the 25th anniversary of his 1989 Nobel peace prize.